A lot of people think that once summer ends Camp ends. This is not the case at all. 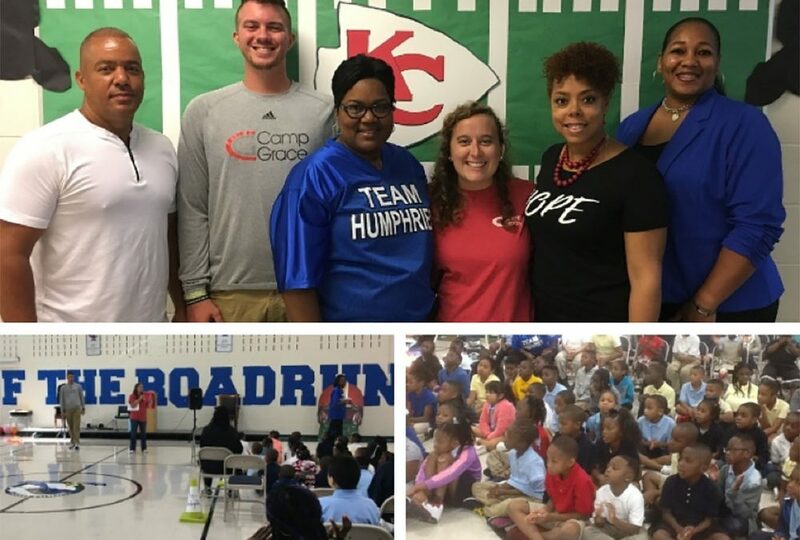 Camp Grace continues throughout the year through our partners like Humphries Elementary School. Back in August, I had the privilege of attending the first Roadrunner Rally, the first pep rally of the year, for Humphries Elementary in south Atlanta. Humphries has brought campers the last few years and are a great ministry. The principal, Melanie Mitchell, is a great woman who combines her passion for educating youth with her love for the Lord. The biggest example of this is the system she has set up at Humphries that encourages students to have good behavior, do their homework and come to school with the opportunity of coming to Camp Grace during the summer. She loves the students at her school and personally does the fundraising to cover the costs to get them to camp. When Melanie asked me to come to their opening pep rally, I was thrilled. The pep rally was to set the tone for the school year. It was to encourage the students to have fun at school while also providing incentives for good behavior. While coordinating for the event, we decided to play off of the character qualities we discuss during a week of camp. During camp, campers are given opportunities to earn five different color ‘Camp Grace’ silicone bracelets when they are exuding certain character quality traits. The bracelets represent character qualities that the counselors see in the campers. The qualities we reward are sharing, patience, obedience, kindness and courage. Turning these qualities into games was a lot of fun. The students competed alongside their teachers to complete tasks in one of the five categories. My favorite game of the pep rally was for the courage band. We had a box that the participants had to stick their hand in and feel an object. Based off their touch, they had to guess what the item was. We had them feel a sponge, Play-Doh, a rubber duck dressed as a unicorn, a racecar and slime. Being at Humphries was a lot of fun. It was great to see some former campers and hear how the rest of their summer went and how their first week of school was going. It was great to connect with the campers outside of camp and see them at school talking about their summer with their friends. They were telling others about how they needed to do certain things this school year so they could come to Camp Grace next summer. Can’t wait to see them again for our next visit!